The first day lasted 25 hours. We drove to Sioux Falls early Tuesday morning. When I arrived in Japan and checked into my BOQ room at Naval Air Facility Atsugi, Wednesday morning's Today show was on television. The Boeing 747 left Seattle Tuesday afternoon at 5:00 South Dakota time and landed at Narita International Airport outside Tokyo Wednesday afternoon at 4:40 Japan time--a ten hour flight with a 14 hour time change. The afternoon sun shone brightly the entire trip. A 3x3-inch TV screen mounted in the seatback ahead of me contained a channel that tracked our course west across Alaska and southwest across the Pacific Ocean. We crossed the International Date Line at a ground speed of 544 mph, with a southeast wind of 49 mph. A world map occasionally flashed on the screen. When it started showing Asia instead of North America, with cities like Calcutta, Beijing, Bombay and Tehran replacing Detroit and San Francisco, I knew I was on the other side of the world. Walking off the airplane in a foreign country didn't concern me because I trusted my new command to send someone to meet me. After going through customs, I stood in the lobby with my luggage until two officers walked up and introduced themselves. We got acquainted on the two-hour drive to NAF Atsugi. They dropped me off at the BOQ, where a room was reserved for me and its refrigerator stocked with food. I expected to sleep late Thursday morning, and then report to my boss, Commander Fleet Air Western Pacific. But, no, I was scheduled for driving school at 7:45 because I "would probably be up in the middle of the night anyway." Jet lag, however, didn't prevent me from getting a good night's sleep. The driving school provided my introduction to Japanese culture. Our Japanese instructor explained that because of the strong influence of the United States (in technology, music, democracy, culture, etc. ), English words are considered sophisticated and intelligent. Owning a car is a privilege in Japan, and anyone with a driver's license is considered a professional driver. Two-wheeled vehicles and pedestrians have the right of way. The driver of a car is almost automatically at fault in an accident. 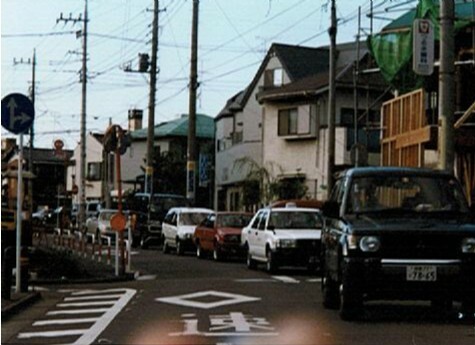 Traffic citations are written in kanji (the symbols used for writing). The military Status of Forces Agreement with Japan says we aren't required to sign anything we can't read. However, anyone who refuses to sign a traffic citation can be thrown in jail, and the authorities have fifteen days to provide notification that a person is in jail. Traffic fines can be paid at banks and post offices. 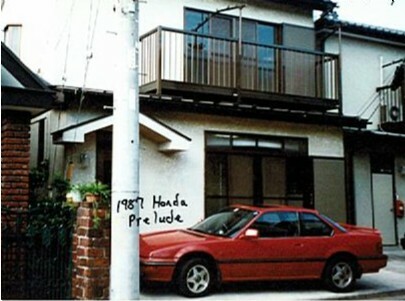 After buying a red 1987 Honda Prelude, I practiced driving on base for several days before venturing out in town. I'm now accustomed to driving on the left side of the road, but I do a frequent mental check to ensure my side of the car is against the centerline and not the curb. I think ahead about which lane to be in after completing a turn, and I still occasionally turn on the windshield wipers instead of the signal lights. Most side streets look like narrow alleys, but are designed for two-way traffic. Some larger streets have narrow strips along the curb for bicycle and pedestrian traffic. Numerous electric poles are almost in the traffic lane. Since there are very few parking spaces, cars and trucks park in the street, and traffic is forced to cross the center line to get around them. Motorcycles and bicycles pass on both sides without warning, and drivers must be careful when swerving to avoid parked vehicles not to get in a cyclist's path. Average speed limits in town are 30, 40 and 50 kph, depending on the width of the road. Courtesy and patience are critical, and vehicle drivers seem to have plenty of both. NAF Atsugi's housing office takes military personnel on househunting trips with rental agencies, serves as translator, explains the rules and looks out for our interests. They inspected my house and provided a Navy-approved lease (in English and kanji). I rented a two-story, two-bedroom house (935 square feet) four miles north of NAF Atsugi, in the town of Yamato. It takes 20-35 minutes to drive to work because of the narrow, congested streets. Four month's rent is required up front. I paid the usual deposit and first month's rent. The Navy paid the appreciation fee (a thank you to the owner) and the agent's fee. Japan reimburses the U.S. for utilities, the actual amount of the utility receipts we turn in each month. Our paycheck contains a utilities allowance, an average for the area, not actual reimbursement for what we spend.